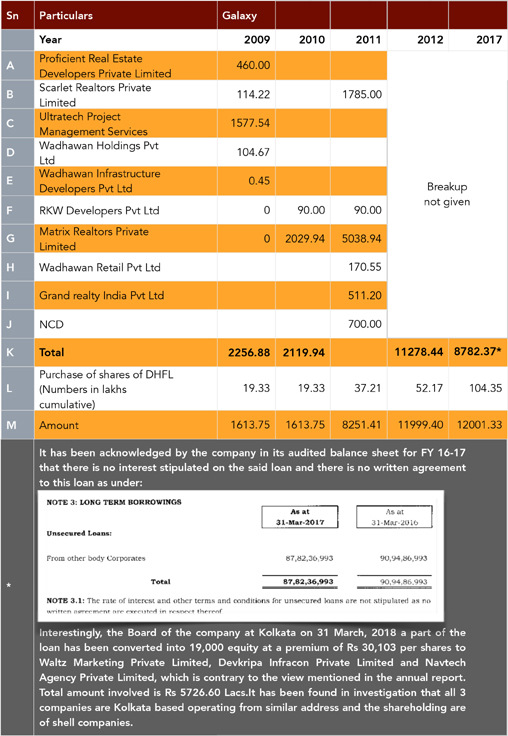 By closely scrutinizing public records available with public authorities and information available in public domain, Cobrapost has unearthed a financial scam where the primary promoters of Dewan Housing Finance Corporation Limited (DHFL) and their associate companies have committed a systemic fraud in broad daylight to siphon off public money amounting to more than Rs. 31,000 crore. The scam has been pulled off mainly by sanctioning and disbursing astronomical amounts in secured and unsecured loans to dubious shell/pass-through companies, related to DHFL’s own primary stakeholders Kapil Wadhawan, Aruna Wadhawan and Dheeraj Wadhawan through their proxies and associates, which have in turn passed the money on to companies controlled by the Wadhawans. The money has been used to buy shares/equity and other private assets in India and abroad, including in countries like UK, Dubai, Sri Lanka and Mauritius. The anatomy of the scam, as illustrated herein, has repercussions for the larger financial system in India. As an industry practice, loans are advanced to companies and are secured by not only the properties of the borrower company but also by personal guarantees of promoters of companies. By lending to shell/pass-through companies without due diligence, DHFL has ensured that the recovery of such dubious loans is impossible since the companies or their directors themselves do not own any assets. This way the properties/private wealth acquired by the Wadhawans and their associates by using the funds from these dubious loans are completely ring-fenced from any recovery process that may be initiated by authorities under the SARFAESI Act or Insolvency and Bankruptcy Code of India. Thus, the only losers in the entire process would be small public depositors, the public sector banks, such as State Bank of India and Bank of Baroda, with an exposure of over Rs. 11,000 crore and Rs. 4,000 crore, respectively, foreign banks and public shareholders/investors of DHFL. Debt recovery is an important metric on which ease of doing business is judged. Such scams, if not identified, resolved and persons responsible punished, will only affect India’s prestige on the world stage. In case, the Government of India takes over DHFL, as it took over IL&FS, without a thorough investigation into its affairs by investigating agencies such as CBI, SFIO and Enforcement Directorate, then the Wadhawans who are principal beneficiaries of the scam will go scot free. Bought Wayamba, a Sri Lanka Premier League cricket team, by using loan money dubiously advanced by DHFL. SEBI (Listing Obligations and Disclosure Requirements) Regulations, 2015 on Risk Management Committee and Finance Committee whereby compliances and disclosures have been made for transparent and for better corporate governance, and the board members are obligated to constitute a Risk Management Committee to review the risks related to loans. Various Instructions/Directions of National Housing Board on inter alia anti-money laundering, corporate governance, prudential norms, etc. Section 182 of Companies Act, 2013 for political donations. Section 447 of Companies Act, 2013 for fraud. Section 177 of Companies Act, 2013 for Audit Committee. Section 186 of Companies Act, 2013 for breaching the limit of investment. Section 185 of Companies Act, 2013 for investment in companies where directors have interests. Section 45 of Income Tax Act, 1961 for escaping the Capital Gain Tax. Section 68 of Income Tax Act, 1961 for unexplained investment. 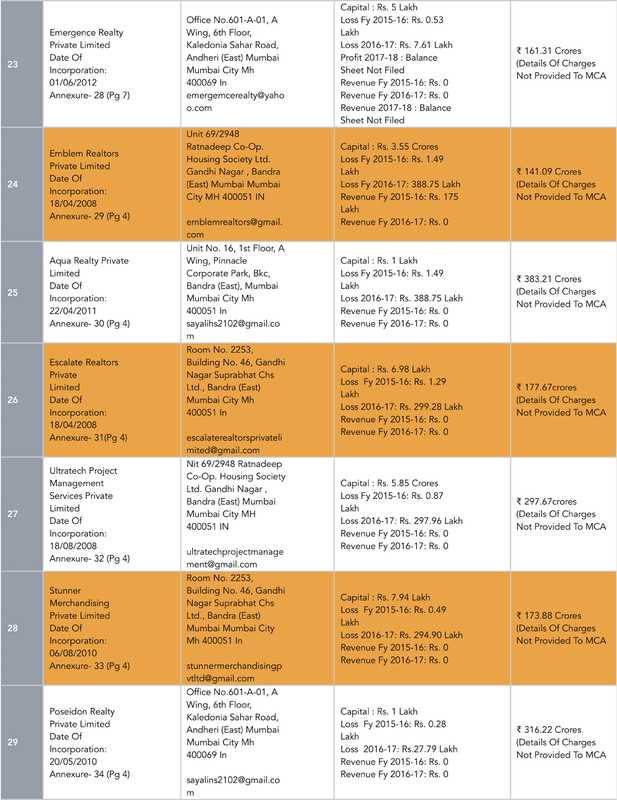 Schedule III of Companies Act, 2013 for deviation in disclosure in financial statement. Section 201 of Income Tax Act, 1961 for delay in deposit of Tax Deducted at Source (TDS). Section 6 of the Foreign Exchange Management Act, 1999 (42 of 1999), read with Foreign Exchange Management (Transfer or Issue of Any Foreign Security) Regulations, 2004 for foreign divestment of shares. For misappropriating public money and converting it into various movable properties for their own use, under Section 403 of the IPC. For criminal conspiracy with various persons in concert and dishonestly disposing of properties in violation of several legal contracts, under Section 405 of the IPC. For having committed wilful “criminal breach of trust” and having fooled DHFL’s shareholders and common investors, under Section 405 of the IPC. For wilfully deceiving DHFL’s investors, and fraudulently influencing their decisions to invest in a corporation routing their money to criminal agents, in violation of the investors’ legal rights and cause them material damage, under Section 415 of the IPC. For criminal conspiracy to cheat and defraud investors and loot their hard earned money, under Section 420 of the IPC. For misrepresenting important documents held sacrosanct by investors, such as government disclosures that give an overview of DHFL and its various promoters’ net share in the company and its dealings in movable properties, under Section 467 of the IPC. For money laundering, under Section 3 of the PMLA. All these violations have taken place right under the nose of the Reserve Bank of India (RBI), the SEBI and the Union Ministry of Finance, not to mention monitoring mechanisms of the banks, the auditing agencies, the Income Tax Department, the rating agency and so on. Not only does the scam point fingers squarely at the inefficient corporate governance of non-banking financial companies (NBFCs) as a whole but it also questions the dubious role public bodies have played in effecting the scam. It is a clear case of complete connivance amongst public and private figures. An interesting part of the scam is that donations of Rs 19.5 crore have been given to the BJP between the financial years 2014–15 and 2016–17 by RKW Developers Pvt. Ltd., Skill Realtors Pvt. Ltd. and Darshan Developers Pvt. Ltd., respectively. All these donors are linked to the Wadhawans. Of the three companies playing a benefactor to the BJP, RKW Developers, with a donation of Rs. 10 crore in 2014–15 and Darshan Developers (Darshan) in 2016–17, with a donation of Rs. 7.5 crore, top the list, shelling out huge amounts in political charity. 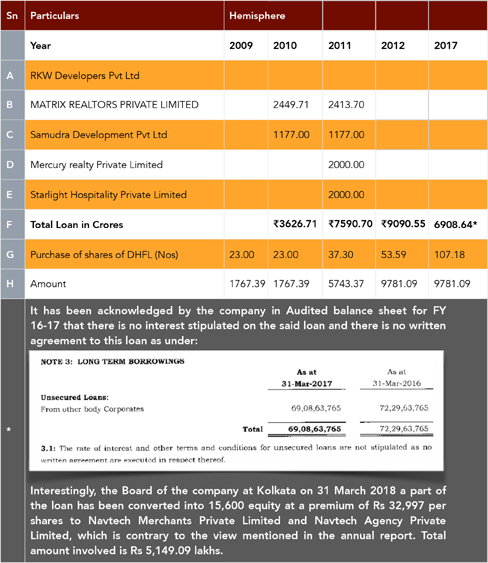 Interestingly, RKW Developers has not shown any donation in its balance sheets for the fiscal 2014–15. Similarly, Skill Realtors donated a sum of Rs. 2 crore in 2014–15 but failed to show the same in its balance sheets. While receiving and reporting these donations, the BJP also failed to provide PAN details of these donor companies. These charities, however, flout the provisions of Section 182 of the Companies Act 2013, which govern corporate funding to political parties. All such donations have to be shown in account books of the donor companies. Interestingly, the government in 2017 brought a new amendment to Section 182 of the Companies Act, which in effect enables such dubious political funding without any consequences. However, it is to be noted that the above contributions were in violation of Section 182 as applied then. 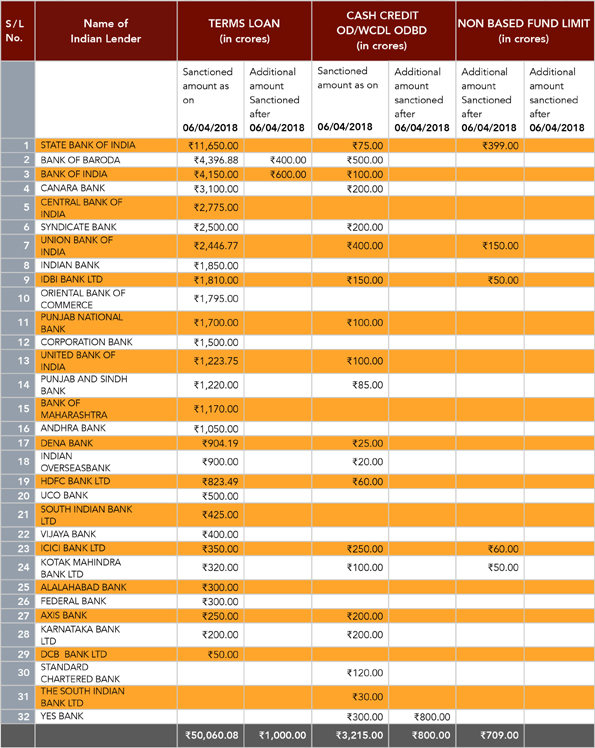 The following case studies the Cobrapost team has put together in this story makes it clear that all these companies have made donations without bothering to act in accordance of the law. Although posting a loss of Rs. 24,77,828 in 2012–13, RKW Developers Pvt. Ltd. had the resources to contribute Rs. 10 crore to the BJP coffers in 2014–15. 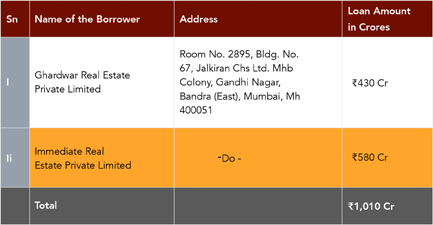 However, the Mumbai-based real estate company did not show this donation in its balance sheet for the fiscal concerned (Annexure 1, Director report 2011-2012, Director report 2013-2014, Director report 2014-2015, BJP 2014–15, Annexure 2 Balance Sheet RKW 2014-2015). While donating Rs 2 crore to the BJP in 2014–15, Skill Realtors did not mention the donation in its balance sheets and failed to file profit and loss account with the Registrar of Companies (RoC). Curiously, the Mumbai-based construction company made this huge donation out of a measly profit of Rs. 26,914 (Annexure 3: BJP 2014–15; Director Report 2010-2011, Director Report 2012-2013, Annexure 4 Balance Sheet 2014–15). Darshan Developers donated Rs 7.5 crore to the BJP in 2016–17. It is noteworthy that the company incurred a loss of Rs. 5,13,406 in the fiscal year 2013–14 and Rs. 4,650 in 2014–15. The company made a measly profit of Rs 2,82,691 (Annexures-5, 5a and 5b, 5c). The company was, therefore, ineligible to make any donations to any party in such large sums, as the amount donated far exceeds the 7.5% of its profits as stipulated by law. As per the Companies Act, this violation is punishable with six months’ imprisonment and a fine up to five times the donated amount. By the end of 2018, the RBI and the Finance Ministry came to loggerheads over the formation of policies to regulate and control NBFCs. Following the collapse of India’s leading infrastructure finance company, Infrastructure Leasing and Finance Services (IL&FS) after it defaulted on payments to lenders, the NBFCs faced an enormous liquidity crunch as the corporates lost faith in NBFCs and withdrew their money from mutual funds and put them in the banks. The NBFCs underwent a severe liquidity crisis, in turn squeezing lending to MSMEs and prompting the Government of India to step in to take control of IL&FS and try to contain the damage done to the financial ecosystem. While the RBI rooted for much stricter governance and the ministry looked for quick fixes by providing NBFCs with a special liquidity window. If the ministry has its way, then NBFCs like DHFL, which are committing frauds can easily squeeze through this gaping hole by declaring bankruptcy or showing loans which are actually spurious transactions to shell companies as default. Ignoring the RBI’s warnings and the market’s dire state, Finance Minister Arun Jaitely even took to Twitter, declaring that “the government will take all measures to ensure that adequate liquidity is maintained/provided to the NBFCs”. Former RBI governor Urijit Patel came under immense pressure from the government to toe the line, just as his predecessor, former governor Raghuram Rajan was at one point of time. The Centre has, since the later part of 2018, exerted immense persuasive techniques on the RBI to relax restrictions on weak banks to lend to small businesses and deploy the RBI’s capital reserves to generate additional liquidity and exempt power companies from the purview of a 12th February, 2018 circular on bad debts. The RBI has already ceded somewhat to the pressure from the Centre and declared that it will allow high-street lenders to part-support bonds sold by non-banking finance/housing companies, an approval that will ease fund-raising concerns at the shadow banks currently struggling to garner money from the debt market. A credit enhancement is a kind of support behind any bond sale, which helps improve good faith with investors. Banks are, therefore, already allowed to provide partial credit enhancement to bonds issued by the systemically important non-deposit taking non-banking financial companies (NBFC-ND-SIs) registered with the RBI and housing finance companies registered with National Housing Bank. DHFL is a listed NBFC in the business of lending money especially to promoters who are apparently engaged in slum rehabilitation, housing development and other real estate businesses. However, any listed entity cannot, in any legal way, give away secured and unsecured loans to dubious shell companies, which can then be converted into private wealth for promoters. To give the readers an idea of the scale of fraud, DHFL’s net worth is, according to its audited financials for 2017–18, Rs 8,795 crore. 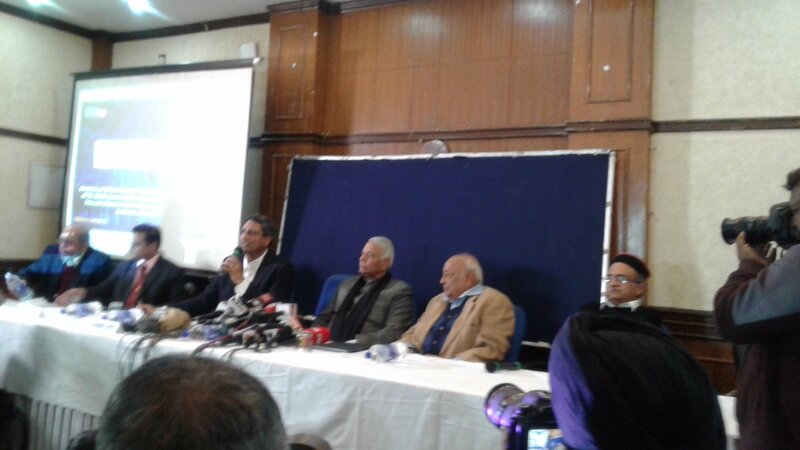 It has, however, taken loans from banks and financial institutions to the tune of Rs 96,880 crore, including Rs. 31,312 crore in the form of non-convertible debentures, Rs. 36,963 crore from banks, Rs. 2,965 crore from external commercial borrowings, Rs. 2,848 crore from the National Housing Board (NHB), Rs. 9,225 crore in public deposits and Rs. 13,567 crore from other sources. Out of this sum, the company has disbursed Rs. 84,982 crores in loans and advances to other entities. According to the annual report, DHFL has secured loans from at least 36 banks, including 32 nationalized and private and six foreign banks. 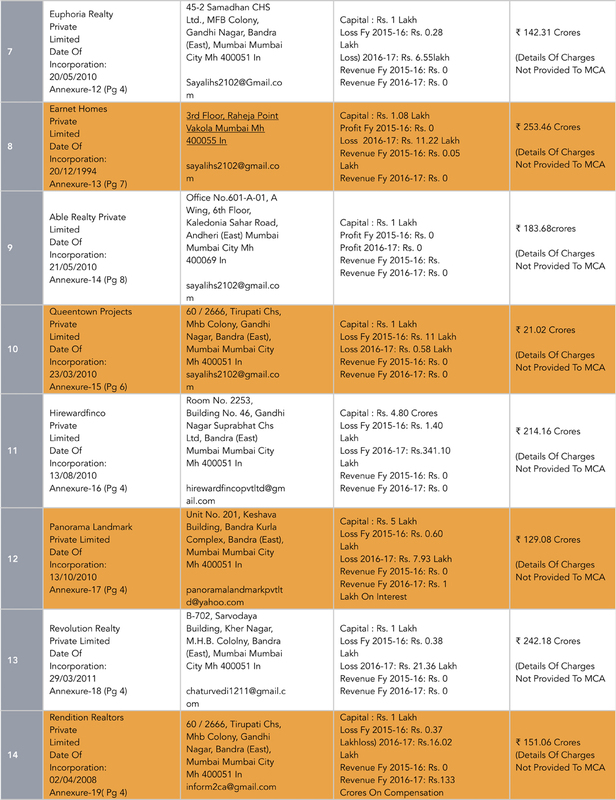 Its exposure to banks is listed in the table below (Annexure 6). Cobrapost investigation has revealed that DHFL has lent substantial sums to shell companies, which have been created just to siphon money out of DHFL and channelize it elsewhere, mostly in companies wherein Kapil Wadhawan, Aruna Wadhawan and Dheeraj Wadhawan have personal interests. To park public money into private accounts or create shell companies to convert that money into private wealth is completely illegal and in violation of a number of Indian laws. The list of violations, as already mentioned, is so varied and so outrageous that it puts any other scam of the same nature to shame. 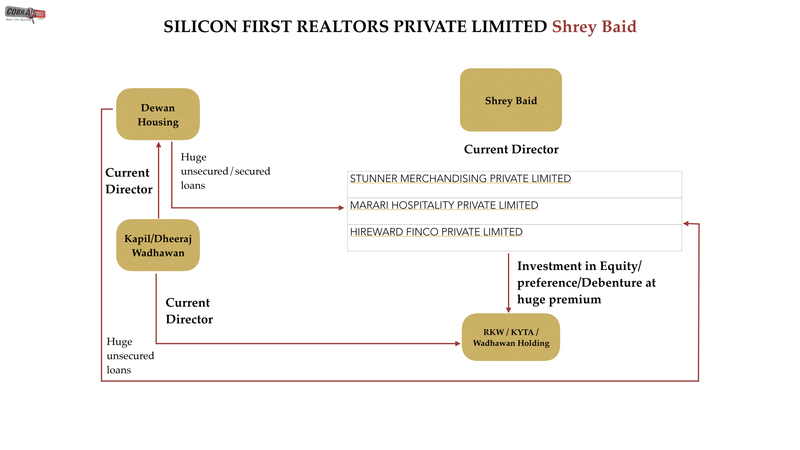 Compared to the DHFL, the Saradha and the Nirav Modi/PNB scam look like the work of amateurs. This is the most important question. How does a public listed company get away with siphoning thousands of crores and where has all that money gone? As Cobrapost has discovered, there has been a concerted effort at funneling money into dubious entities by extending to them secured and unsecured loans, illegal insider trading, tax evasion and creation of offshore assets, to systematically siphon off the public money in large corpuses to be finally converted into private wealth of the ultimate beneficiaries of the scheme, the Wadhawan Group. The Wadhawans have been so audacious and brazen in their misdemeanors that they have not even attempted to cover their tracks while working on their schemes. 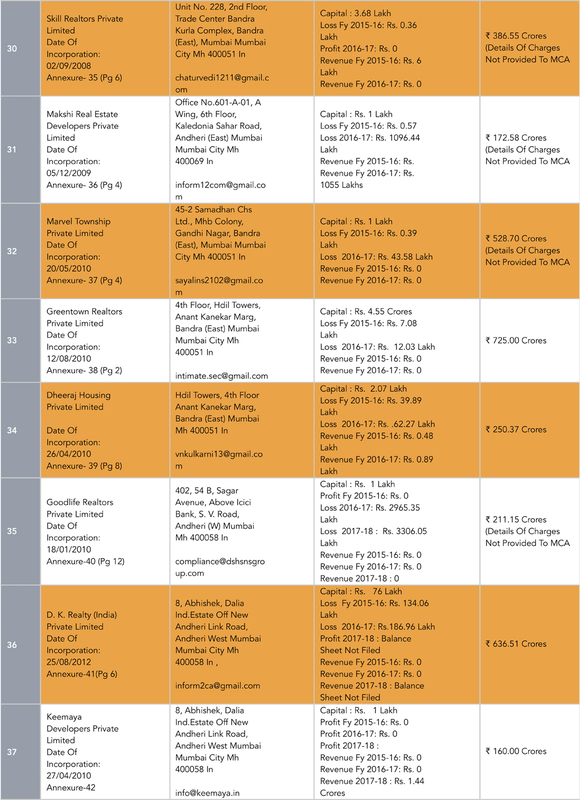 As the table given below shows, there are 45 companies which were used as vehicles to siphon off funds from DHFL. In all, these 45 companies were given loans in excess of Rs 14,282 crore. Out of these, 34 shell companies, which are all within the interest of Wadhawan Group, the chief promoter of DHFL, have been given unsecured loans amounting to Rs. 10,493 crore. 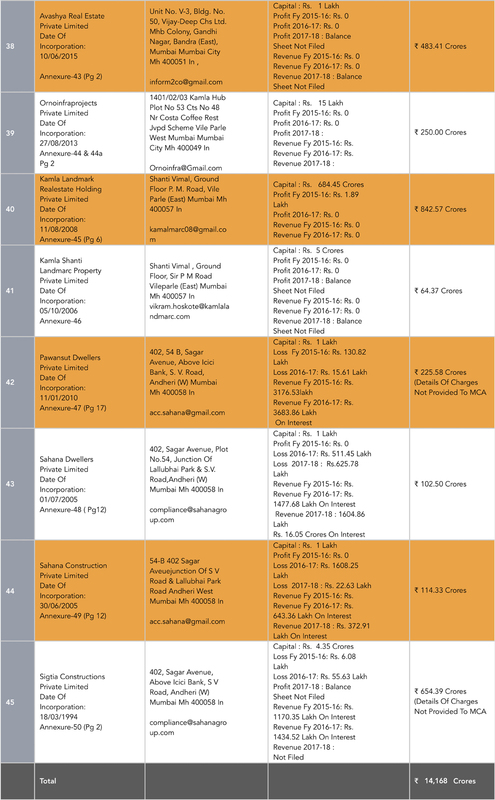 Of these, 11 companies belong to Sahana Group, which have been given Rs. 3,789 Crore in loans. Companies 1 to 34 in the consolidated table are so dubious that most of them have no business or income. More often than not, they are audited by the same accounting agencies, such as Thar and Co, helping them hide all fraudulent transactions. Many of these companies operate from the same addresses and are run by the same group of initial directors. A large number of them are newly incorporated with nominal capital of around Rs. 1 lakh. Yet, these companies were extended unsecured loans, in single tranches, without any security and/or collateral. Many of these companies not only share the addresses but they also have the same email addresses. Of the 45 companies, 6 are using the same official email address inform2co@gmail.com, while four are using inform2ca@gmail.com and three are using Inform12com@gmail.com. Ten others are using sayalihs2102@gmail.com. Interestingly, nearly 35 shell companies have not filed any charge documents for loans on the MCA website, which is a mandatory requirement. This suggests the loans are unsecured. Most of the companies have also ensured to hide the name of the lender company, DHFL. 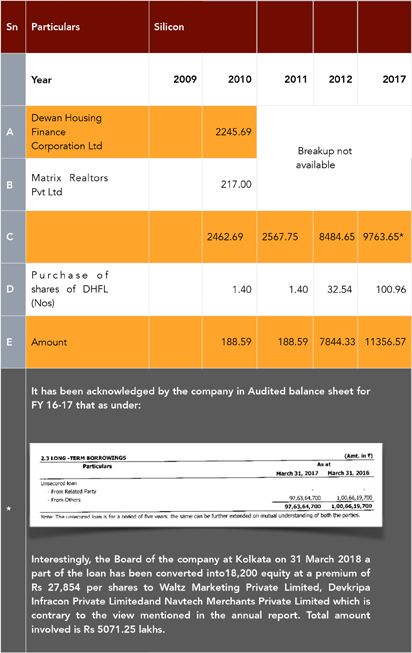 In turn, DHFL has also hidden the terms of loan and terms of repayment in its financial statement. Importantly, all the shell companies have zero or very negligible income from their business operations since their inception. 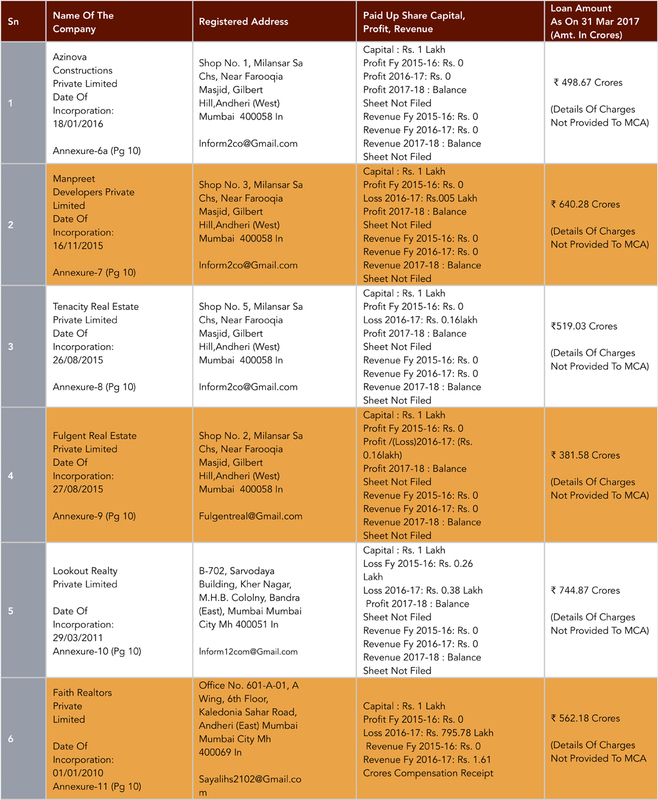 Besides, more than a dozen companies have not filed balance sheets for FY 2017–18 in the RoC as of January 26, 2019. 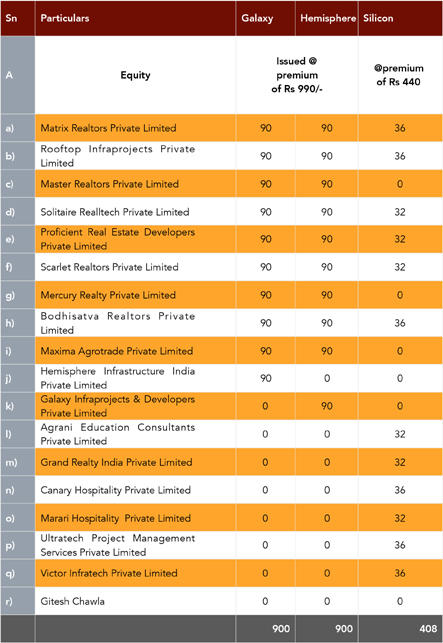 Companies at numbers 35 to 45 belong to Sahana group. One of of directors these companies, Jitendra Jain, is being investigated by the Economic Offences Wing with respect to various projects for certain offences committed by him in his professional capacity and is currently in judicial custody. Another prominent shareholder of the group is former Shiv Sena MLA Dalvi Shivram Gopal. Most of the loans extended to Sahana have become NPA. It has hatched a group of shell entities, often with common addresses of operation (a coincidence too blatant to not be noticed) and even common initial directors having no background or income. These shells also frequently have the same auditors who help hide information and facilitate the scam. In project financing, the company taking a loan from an NBFC must stake some resources or funds of its own, which is known as debt equity. This is the equity against which the NBFC sanctions the loans. The ratio of loan to debt equity is usually 4:1 or 3:1. 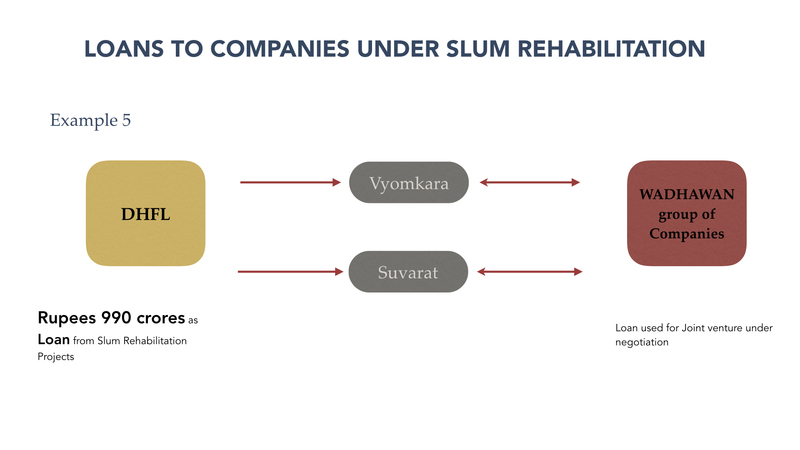 But in the case of the illustrated six groups of shell companies, all contenders for slum rehabilitation programmes, no debt equity has been specified or shown. No NBFC in its right mind can sanction and disburse humongous amounts of public money in loans to companies of no standing, which can show no debt equity, are all newly incorporated and are only Rs. 1 lakh in net worth. This is not only avoidance of due diligence but intentionally fraudulent and irregular. Payments of the loans, especially of such huge amounts, are never made in one tranche. They are only disbursed after reviewing the progress of the projects for which the companies have availed the loans. 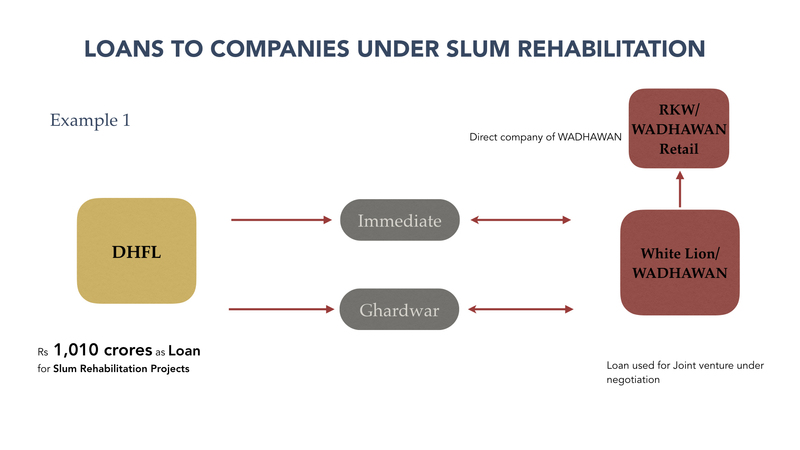 In all the cases reviewed in the course of the investigation, DHFL has disbursed loans amounting to more than thousands of crores at one tranche, without paying heed to whether the slum rehabilitation projects are at all in progress. 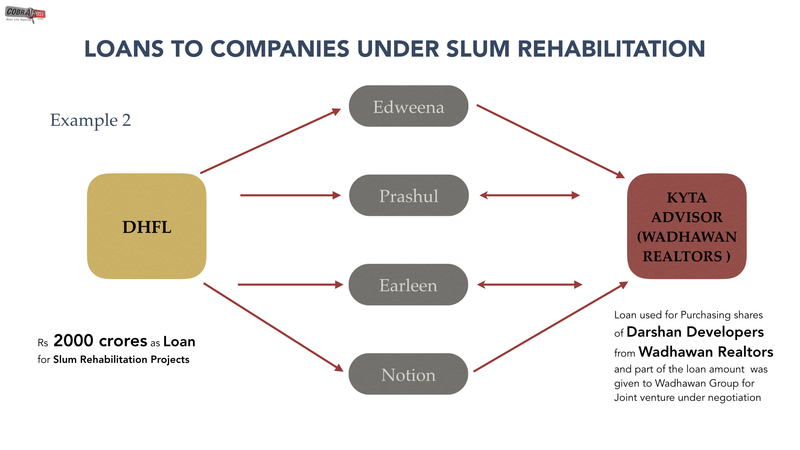 On closer inspection, it has been found out that several of these shell companies, which availed loans from DHFL under the slum rehabilitation programme in Mumbai, are not named directly in the website of Slum Rehabilitation Authority (SRA) as having ever undertaken any such projects. Only a part of the loans has been investigated. 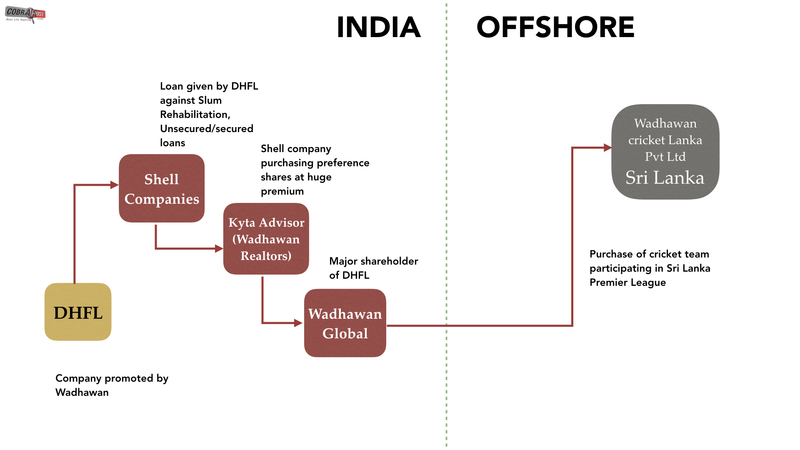 A detailed investigation into the individual groups of shell companies revealed the seamier side of the scam. Their modus operandi is to loan out large sums of money under project heads to companies of no standing. 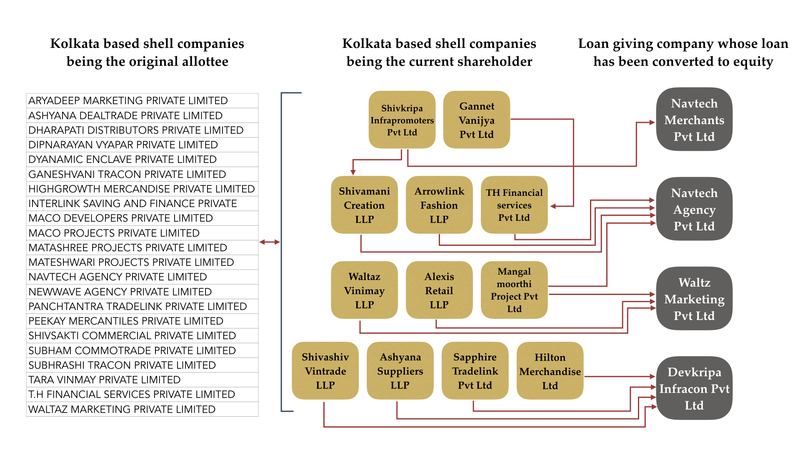 The exact scheme of transactions has been replicated at various times while giving out loans to these groups of shell entities and the pattern is clearly visible as we go through each of the six sets of shell companies. a. 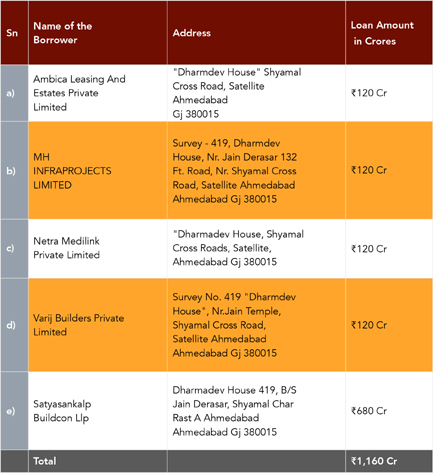 Group 1: Immediate Real Estate Private Limited and Ghardwar Real Estate Private Limited have been given a loan of Rs 1,010 crore. The net-worth of both companies, which are in turn in negotiations with White Lions, a Wadhwans’ company, for a joint venture, is either negative or below Rs. 1 lakh (Annexures 83and 84). Both the companies have common shareholders/directors in Aparna Sachin Bhatuse and Santosh Krishna Acharya who transferred their shares to the same agents as in case of Group 5, namely, Sukhbir Singh and Arun Vashishta. These names appear in the first group of companies as well, making them persons acting in tandem in these scams. Copies of sanction letters enclosed as Annexures 85 and 86 and Annexures 87 and 88 show that the loans were disbursed for dubious slum rehabilitation projects. The chattered accountants of Bansal Bansal and Co are the same who were auditors of all the companies in Group 1 and Group 4 and Group 5. The amounts thus received have been transferred to RKW and White Lions for alleged negotiation of a joint venture. b. 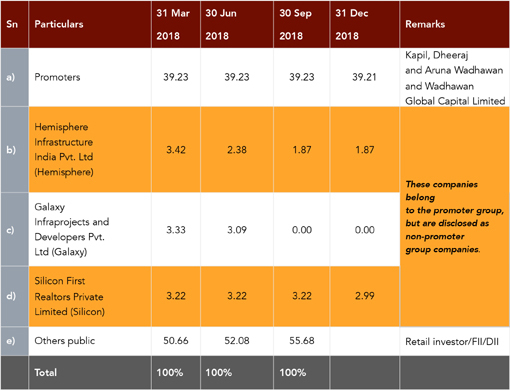 Group 2 of shell entities: Notion Real Estate Private Limited, Earleen Real Estate Developers Private Limited, Prashul Real Estate Private Limited and Edweena Real Estate Private Limited are the second batch of shell entities which have been given a cumulative amount of Rs 2,000 crore. The investigation reveals that all the companies have common initial directors, namely, Aparna Sachin Bhatuse and Santosh Krishna Acharya and shareholders who do not have any background or standing. Disbursing such a large sum to persons having no background itself is questionable. Moreover, there are no assets that the company can show as such. All the mortgage deeds are an eye wash, as revealed by their inconsistencies (Annexures 57, 58 ,59 &60). This money was used by all four companies to purchase shares of Darshan Developers from Kyta Advisors Pvt. Limited (which was formerly known as Wadhawan Realtors). It was further found that Kyta Advisors (promoted by the Wadhawan Group, belonging to Kapil and Dheeraj Wadhawan) was holding around 49 per cent in Darshan Developers. 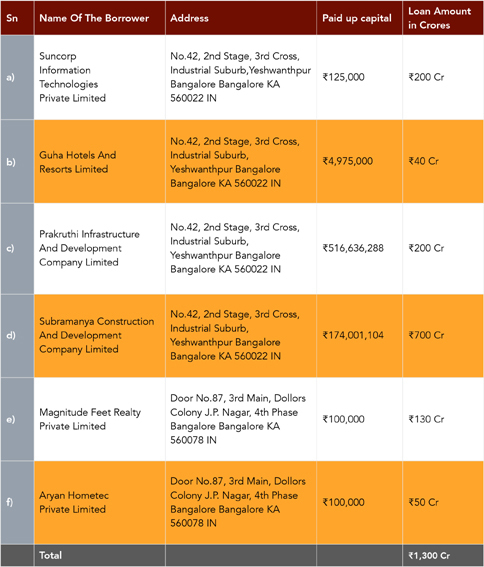 All these companies have purchased the entire shareholding of Darshan Developers from Kyta Developers to create liquidity in the hands of Kyta Developers Pvt. 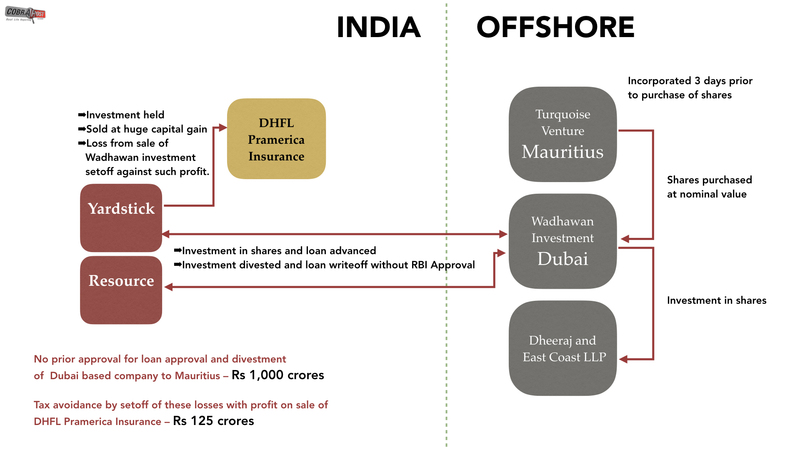 Ltd.
Cobrapost has accessed several legal documents from which it can be safely arrived at the conclusion that Wadhawan Realtors sold shareholding in Darshan Developers to the aforementioned four shell companies. 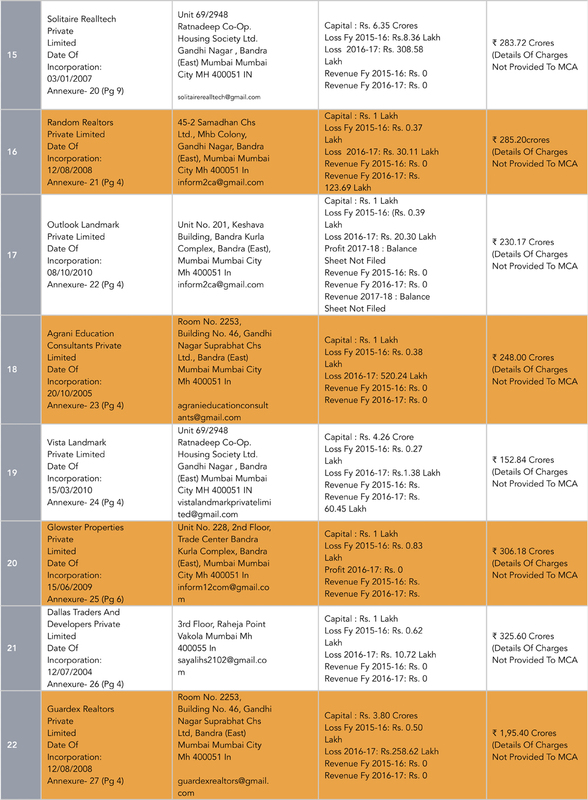 The list of shareholders submitted by Darshan Developers to the Ministry of Corporate Affairs for FY 2015–16 and FY 2016–17 suggests that the name of Wadhawan Realtors had appeared in the list for FY 2015–16, whereas the same shareholding had been replaced with the name of the four above shell companies in FY 2016–17 (Annexures 61, 62, 63, 64). As per the audited balance sheet of Wadhawan Realtors, investment in Darshan Developers appeared till FY 2015–16, whereas it doesn’t appear for FY 2016–17, clearly indicating that the investment in shares of Darshan Developers has been sold. Readers may refer to the copy of the audited balance sheet enclosed as Annexures 65, 66, 67 and 68. 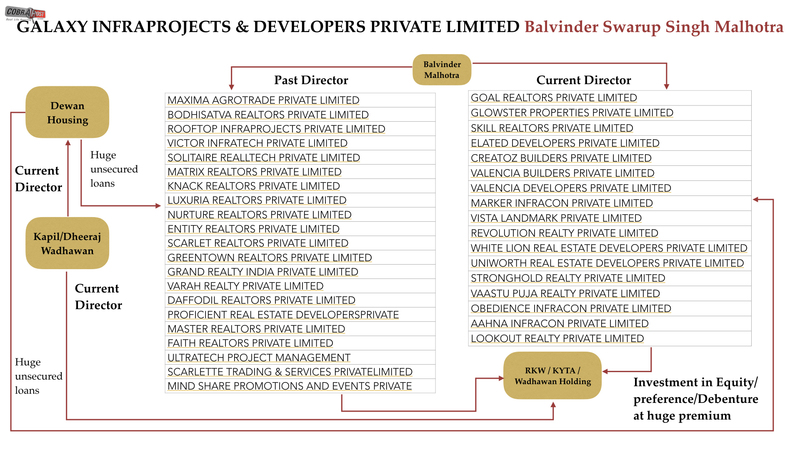 The audited balance sheet of Earleen Real Estate Developers Private Limited clearly specifies that Earleen has made significant investment in Darshan Developer during FY 2016–17, whereas Wadhawan realtor has sold the same during that year. 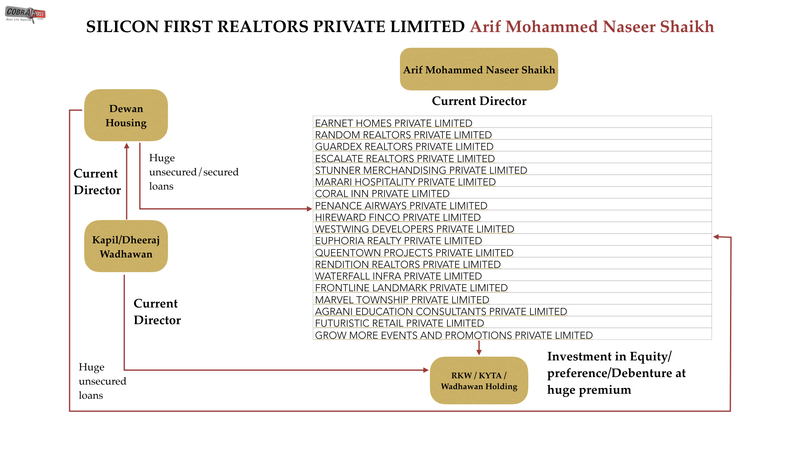 The audited balance sheet of Notion Real Estate Private Limited clearly specifies that Notion has made investment in Darshan Developers during FY 2016–17, while Wadhawan Realtors sold the same during the year. 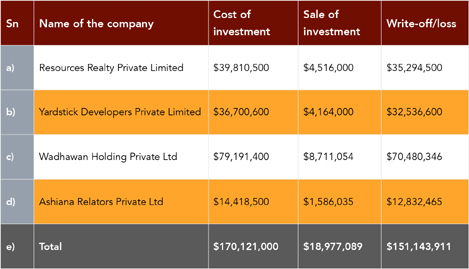 The exact same thing is reflected in the audited balance sheets of Prashul Real Estate Private Limited and Edweena Real Estate Private Limited, clearly suggesting that both Prashul and Edweena have made investments in Darshan Developer during FY 2016–17, when Wadhawan Realtors sold the same during the year. 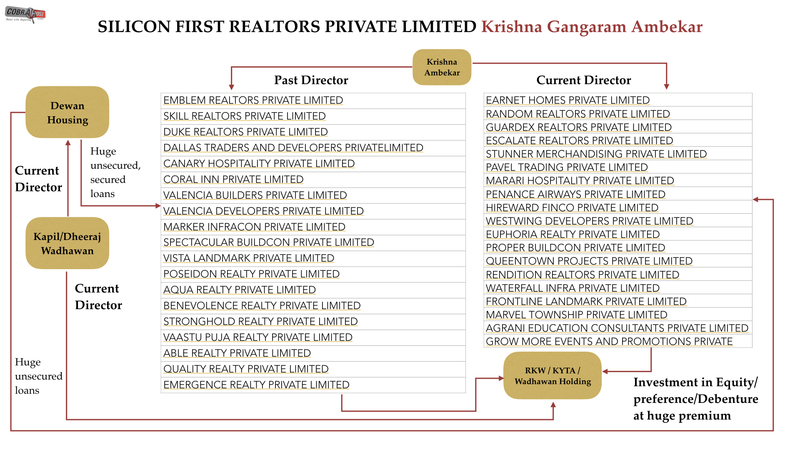 Darshan Developers had, therefore, been purchased by these four shell companies from Wadhawan Realtors (now Kyta Advisors). 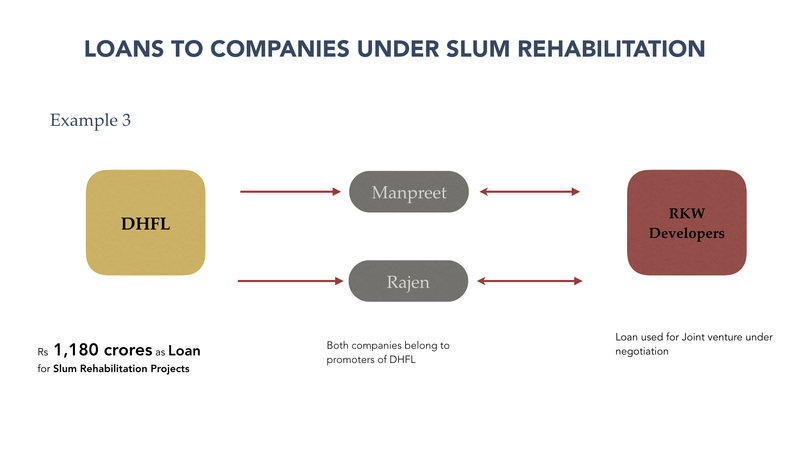 c. Group 3 of shell entities: Manpreet Estates and Rajen Skyscapers (formerly Dheeraj Skyscrapers) have been together given a sum of Rs 1,180 crore in loans for slum development. The serious irregularities in this case are exactly of the same nature as the first two groups. The net-worth of all the companies/LLP are either negative or below Rs. 1 lakh as seen from the audited balance sheets of companies, enclosed as Annexures 69 and 70. The two companies are related, as they have themselves disclosed in their balance sheets. Both the company and LLP have a common director and a common partner, Dhruv Rajen Vasant and Parekh Kishore Shantilal, respectively. The former directors on the board of Rajen Skyscarpers are Dheeraj Wadhawan, Kapil Wadhawan, Pacid Naronha and Bhagwat Sharma, who are the key promoters of DHFL and RKW Developers. The loans of Rs 1,180 crore were sanctioned on similar dates citing loan against the Slum Rehabilitation Project in Bandra, as stated in the copies of the sanction letters enclosed as Annexures 71 and 72. Exactly, like in the previous cases, there is no debt equity that has been specified in the sanction letters, which is again irregular for such large sums disbursed as project loan. No financial covenants have been stipulated either. There are several inconsistencies in the hypothecation/mortgage deeds (addresses and blanks) as shown in the copy of mortgage deeds, enclosed as Annexures 73 and 74. All loans were disbursed to the shell companies in one go, which is also clearly against compliance guidelines. Most of the companies have not disclosed the terms of loan in their financial statements, to intentionally deceive the investors. This disclosure is required under Schedule II of the Companies Act 2013. 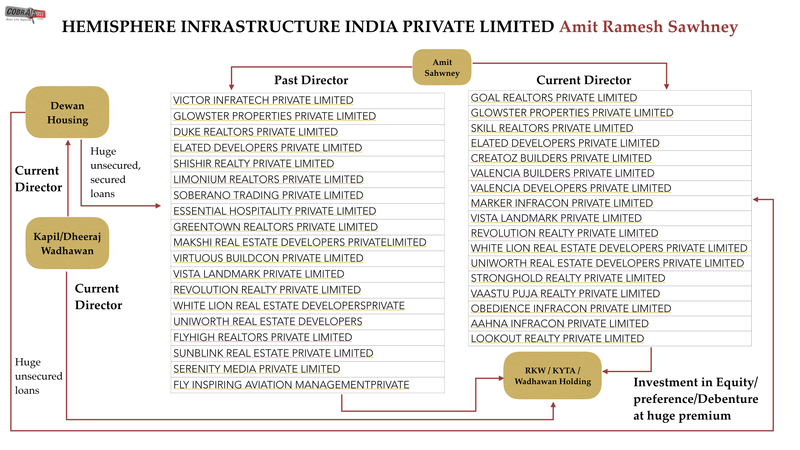 Upon further investigation, Cobrapost also discovered that the website of the SRA, Maharashtra, has not enlisted any of these developers as having undertaken any SRA projects. 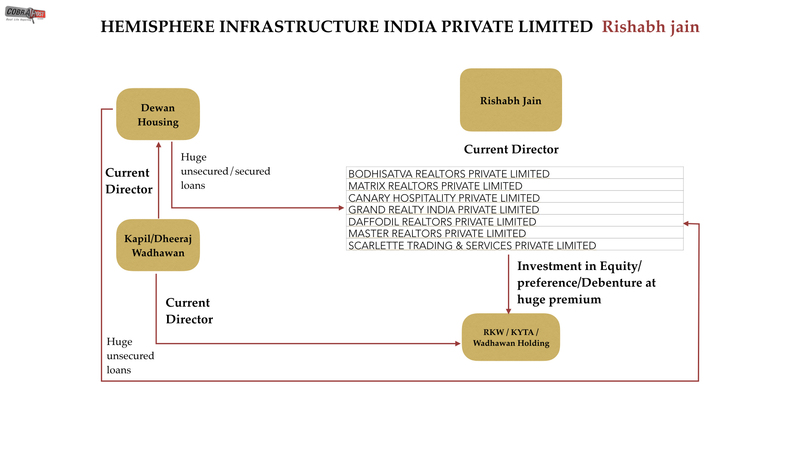 Rajen Skyscrapers is 100 per cent held by RKW Developers, which is promoted by Wadhawans, the promoters of DHFL, thus completing this illicit nexus of entities. The transaction clearly shows the siphoning off money to the tune of Rs. 1,180 crore of fake loans from DHFL by Wadhawans through Rajen Skyscrapers and RKW Developers. 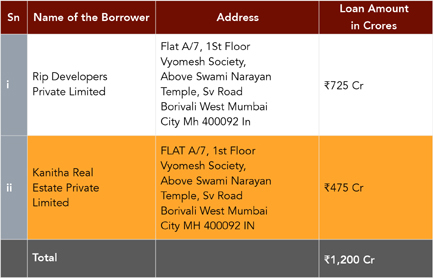 d. Group 4: Wamika Real Estate Private Limited and Prithvi Residency Private Limited have together been granted loans amounting to Rs. 1,010 crore. In a similar pattern, Cobrapost found from the audited balance sheet of companies that the net worth of all the companies are either negative or below Rs. 1 lakh. The companies have the same CA, namely Bansal Bansal and Co, who is also the auditor of all companies in Group 1 above, namely, Earleen Real Estate Developers, Notion Real Estate, Prashul Real Estate and Edweena Real Estate. The companies also have common shareholders, namely, Raghunath Acharya and Sanjay Basantilal. Copies of mortgage deeds, enclosed as Annexures 75 and 76 reveal that the loans were sanctioned on similar dates, without any debt equity or stipulated financial covenants, and were disbursed at one go, in complete violation of pre-disbursement conditions, which is usually to release the money in stages of progress of the project. Yet again, the companies have not disclosed the terms of loan in their financial statements, which is mandatory under schedule II of the Companies Act 2013, apparently to deceive investors. These companies do not appear on the list of developers undertaking SRA projects, as put up on the website of the SRA, Maharashtra. Darshan Developers, the company entering into a joint venture with Wamika and Prithvi, is 49 per cent held by Wadhwan Realtors, which is promoted by none other than Wadhawans, who are the promoters of DHFL. 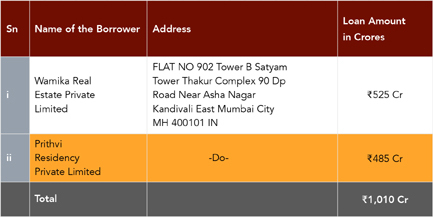 Clearly, Darshan Developers is being used to park the misused public money loaned out by DHFL in the amount of Rs. 1,010 crore. 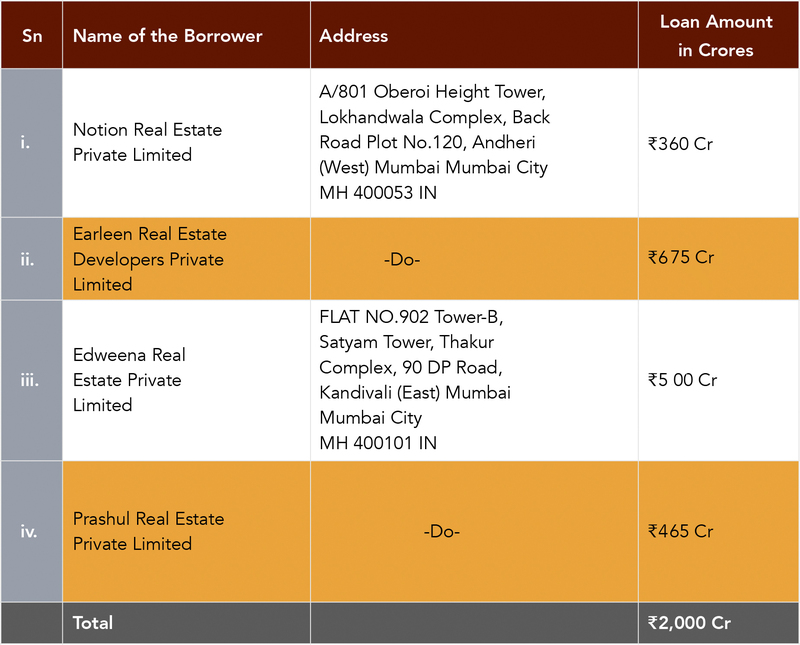 e. Group 5: Suvarat Real Estate Developers Private Limited and Vyomakara Real Estate Private Limited have been given a loan of Rs. 990 crore by DHFL. The net worth of both the companies, which are in turn in negotiations with Wadhawans for a joint venture, is either negative or below Rs. 1 lakh (Annexures 77 and 78. 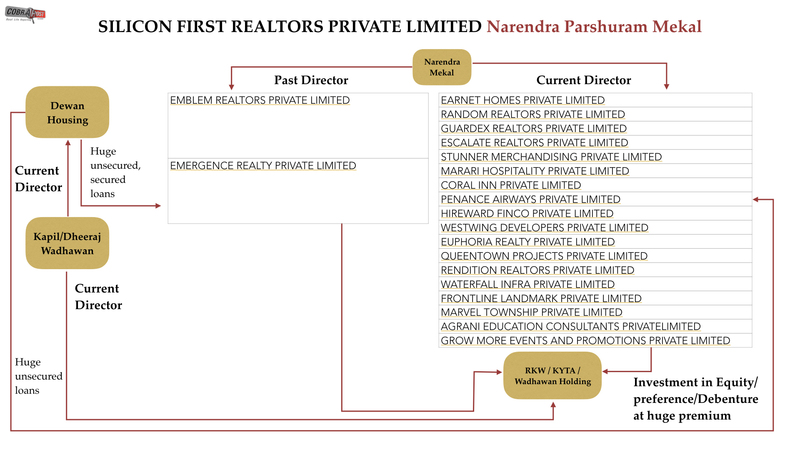 Both companies have common shareholders/directors in Aparna Sachin Bhatuse and Santosh Krishna Acharya, who later transferred their shares to other agents, namely, Sukhbir Singh and Arun Vashishta. These names appear in the second group of companies as well, making them persons acting in concert in these scams. Copies of sanction letters enclosed as Annexures 79 and 80 and Annexures 81 and 82 show that loans were disbursed for dubious slum rehabilitation projects. The chartered accountants of Bansal Bansal and Co are the same who are auditors of all the companies in Group 1 and Group 4 mentioned earlier in the story. 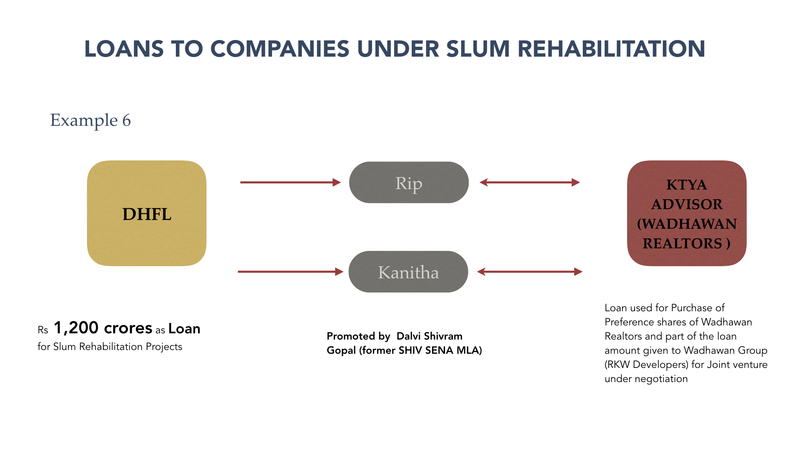 f. Group 6 of shell companies: Kanitha Real Estate Private Limited and Rip Developers Private Limited are the shell entities which were collectively given a loan of Rs 1,200 crore in the name of slum rehabilitation. Exactly like the first group of companies, the net worth of both these companies is either negative or below Rs. 1 lakh, as evident from the audited balance sheets of both companies, enclosed as Annexures 51 (RIP) and 52. All the companies were incorporated in June, 2015. The loans of Rs 1,200 crore were sanctioned on similar dates citing loan against Slum Rehabilitation Project of Nityanand Nagar SRA CHS Ltd at Bandra Reclamation, as suggested by the copies of sanction letters enclosed as Annexures 53 (RIP) and 54 (Kanitha). The inconsistencies in the mortgage deeds (addresses and blanks) are also very apparent (Annexures 55 (RIP) and Annexure 56 (Kanitha)). No debt equity has been specified in the sanction letters, which is unusual for such large sums of project loan. No financial covenants have been stipulated either. As per sanction terms, the disbursement was to happen on compliance of pre-disbursement condition in stages of project progress. 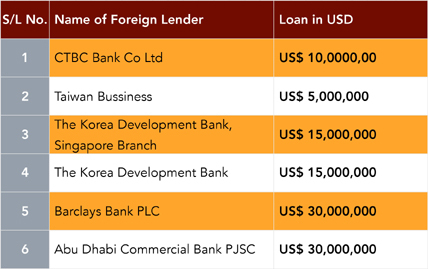 In this case, all loans were disbursed in one tranche. The companies have not disclosed the terms of loan in their financial statements, which is required under Schedule II of the Companies Act 2013, apparently to deceive investors. On further investigation, Cobrapost found that none of the companies appears in the list of developers undertaking SRA projects on the website of the SRA, Maharashtra (List of SRA project, Annexure 56a). All these companies have common initial directors, namely, Aparna, Sachin Bhatuse and Santosh Krishna Acharya, as well as shareholders who do not have any financial background or standing. No NBFC could have give loans to such entities without any background check or due diligence. 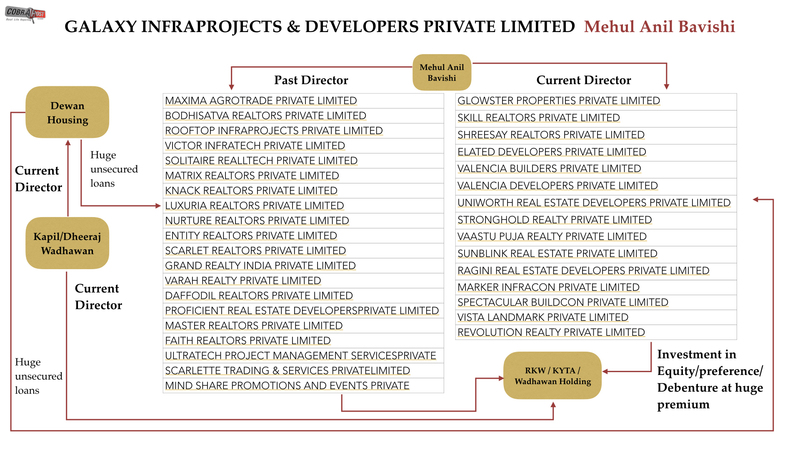 The investigation also reveals that RIP Developers, which holds 99% stake in Kanitha, is promoted by former Shiv Sena MLA Dalvi Shivram Gopal, whose assets have grown by three times between 2004 and 2009 as reported by ADR in 2009. The investigation clearly reveals that the aforementioned loans of Rs 1,200 crore are fake and just a ruse to siphon off money from DHFL by the promoters to their group of companies. The companies also have a direct and strong political connection through Dalvi. Further, we have observed that the charge filed with MCA has been satisfied on September 11, 2018 on the aforesaid loan availed by RIP and Kanitha, which was taken for the slum development project. It is quite surprising that no slum development project came on ground and the loan was satisfied. The question arises as to why the loan was given at all and from where the money came for repayment of the said loan. 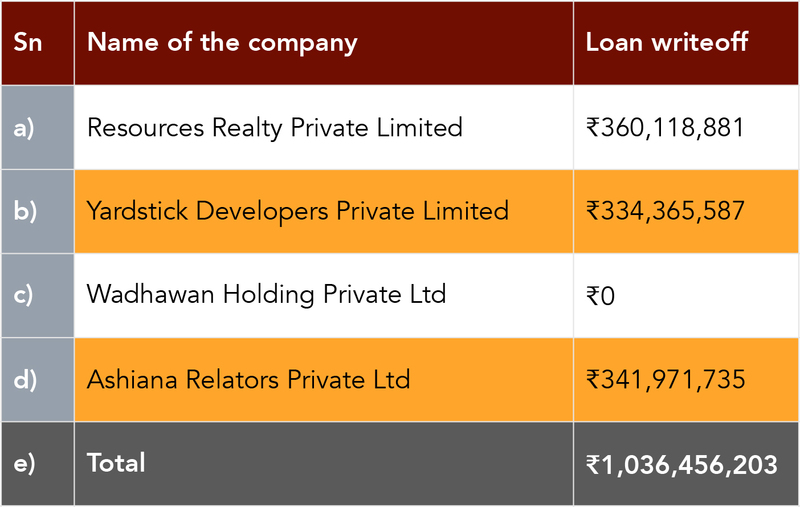 The answer to the first question lies with the clear fact that the loan amount was used to purchase shares of Wadhawan Realators (as per the annual report of RIP and Kanitha for FY 2015–16). Cobrapost has, however, accessed the board resolution (Annexure 56b) dated October 4, 2018, of Kyta Advisors, formerly known as Wadhawan Realtors, and found that they have redeemed the preference shares subscribed by RIP Developers and refunded the money. 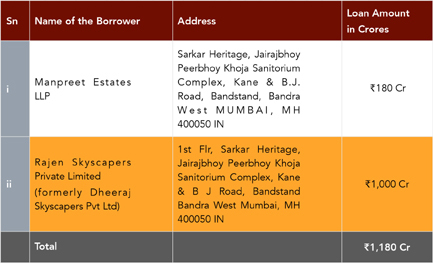 Subsequently, RIP Developers has repaid the loan to DHFL. 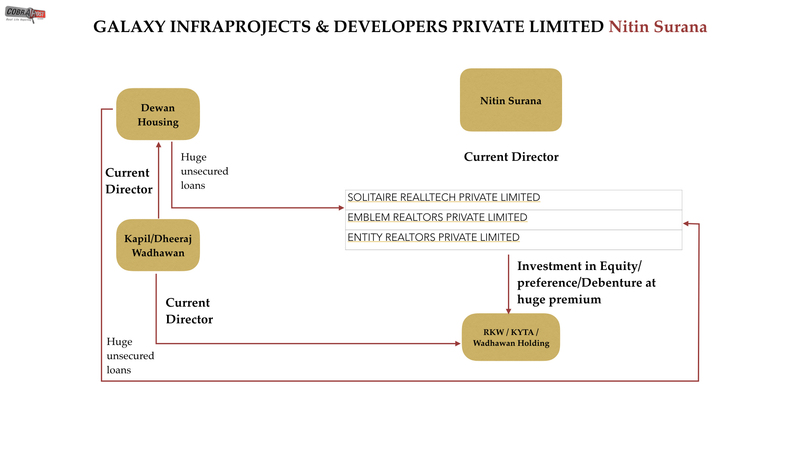 The transaction clearly signifies that the whole purpose the Slum Development Project is being used for extracting public money from DHFL for personal wealth creation. It is to be noted that Wadhawan Realtors enjoyed Rs 631 crore of public money for nearly two years without paying any dividend/interest. DHFL has sanctioned and disbursed large sums, amounting to a total of Rs 1,160 crore, to various Gujarat-based companies under various schemes and projects. All of the said projects are on hold from the municipal corporations and most projects have been suspended. This fact in itself makes all the sanctioned loans bad loans, which were sanctioned against no debt equity. The companies have filed no annual returns. Interestingly, the entire sum of the loans has been disbursed very close to the time of the Gujarat elections, which is a coincidence one cannot entirely ignore. Cobrapost investigation reveals that all the loan guarantees were given by the companies between January and May 2018. No annual returns were filed by them for the year in question. The loan by Satyasankalp Buildcon LLP, for instance, was taken for Swaminarayan Green City, whose environment clearance was taken for Rs. 150 crore, whereas the loan advanced by DHFL was for a sum of Rs. 680 crore (MCA data enclosed as Annexures 89, 89a, 89b, 89c and 89d(colly)). The remaining loans are apparently for the Swaminarayan Business Park, which has been suspended by the Ahmadabad Municipal Corporation for violation of GDCR norms, as per the copy of newspaper clipping enclosed as Annexure 89e . Apparently, non-existent business cities and parks are being built out of thin air as DHFL provides crores of public money to these companies. The DHFL has also sanctioned and disbursed large sums, amounting to a total of Rs. 1,320 crore, to various companies of Karnataka under various schemes and projects. All the aforementioned loans have been sanctioned around the time of the Karnataka state election. Copies of the financial statements of aforesaid companies are enclosed as Annexure 90. The Galaxy, Silicon and Hemisphere are companies incorporated under Companies Act and have a close connection with Kolkata. Things become clear when we take a look at the network of former and present directors of Galaxy, Silicon and Hemisphere. At least 13 persons have been identified who are former and current directors of tens of companies linked to DHFL and the Wadhawans, namely, Mehul Anil Bavishi (Galaxy), Balvinder Swarup Singh Malhotra (Galaxy), Pratim Priya Dasgupta (Galaxy), Nitin Surana (Galaxy), Nadarajan Ramani (Hemisphere), Amit Ramesh Sawhney (Hemisphere), Rishabh Jain (Hemisphere), Mrityunjay Bhadra (Galaxy), Krishna Gangaram Ambekar (Silicon), Arif Mohammed Naseer Shaikh (Silicon), Narendra Parshuram Mekal (Silicon), Rohit Gupta (Silicon) and Shrey Baid (Silicon). These three companies even took loans from three Kolkata-based shell companies, namely, Waltz Marketing Private Limited, Devkripa Infracon Private Limited and Navtech Merchants Private Limited, to pay off outstanding debts on behalf of its other companies. From public records, it appears that loans taken by these companies do not have any written agreements. 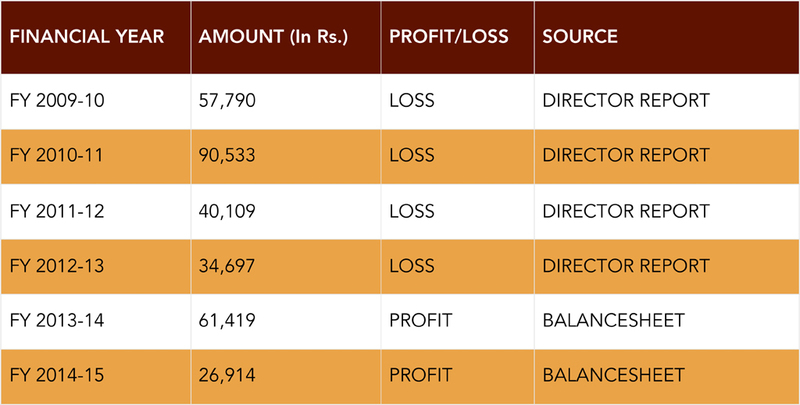 The total loan amount is Rs 57 crore, which has been converted into equity at a huge premium, as the table below shows. The investigation reveals round-tripping of shareholding and investments by all the three companies as a part of money infused as share capital by the shareholders of all the three companies are being given back by all the three companies in the form of investments, which qualifies as cross-holding and is an escape route for Section 68 of Companies Act, 2013 (Buyback Provisions). It is actually a form of reduction of capital and would require prior approval from the government. Cobrapost further found all the unsecured loans to be interest free and that some part of the unsecured loan is being converted into equity just to avoid payment of interest. The management and auditors have claimed that there is no agreement for loan and interest whereas all the loans are being converted into equity. In reality, the company whose loans are being converted into equity is actually a shell company. The shareholdings flow into the loan giving companies whose loans have been converted into equity by Galaxy, Hemisphere and Silicon. Most of the companies are operating from the same address with common directors and do not have any businesses at all. The shareholding of all the three companies put together works out to 10 per cent at the time of acquisition. As can be seen from the shareholding pattern of Galaxy, Hemisphere and Silicon, the shareholding is common and all the companies belong to the Wadhawan Group (by virtue of the common director/shareholder). The loan which has been used for acquiring the shares of DHFL has been funded by Wadhawans who are the promoters of DHFL. The shares acquired by them have to be through open offer, as per SEBI SAST Regulation. The said shareholding of DHFL needs to be categorized under promoter group shareholding, whereas DHFL has deliberately disclosed it as public shareholding, which is a clear violation of SEBI SAST Regulations (copy of SEBI SAST regulation, Annexure 92). These companies were in possession of various insider information, such as the likely liquidity pressure, which had led to the fall in the price of the stock. They have exited the stock well in advance to the extent of 5 per cent to avoid foreseeable losses. This is a clear case of insider trading and violation of SEBI norms on Insider Trading and SAST Regulation (SEBI Insider Trading, Annexure 93). It is important to understand why it is a very serious criminal offence to not only siphon money but to park it through shell corporations in assets created abroad. When an NBFC beset with bad loans finally fails, the banks would catch hold of the directors of these smaller companies which have apparently defaulted on payments. Since the persons acting in concert, in these cases, the small shell companies’ directors, have virtually no money and property or nothing in the way of guarantee, nothing can be frozen as assets against which the debt can be recovered. Moreover, especially if the money has been parked abroad, recovering loans becomes absolutely impossible. Offshore property cannot be utilised as security for the recovery of debt in India. In such cases as DHFL’s, the property is in the name of some other third party, not in the name of either the shell corporations or DHFL. So, when DHFL defaults on loans to banks, the banks cannot seize these properties as the third party has not taken any loans directly from them. To that extent, DHFL and its promoters are engaging in criminal conduct by defrauding the public of thousands of crores of rupees and using it to create private wealth offshore, which cannot be used to secure its loans. Ultimately, it is the banks which shall bear the brunt. Kapil Wadhawan, a promoter of DHFL, on February 23, 2017 incorporated in the UK a company called Wadhawan Global Capital (UK) Limited. A large sum of money, of approximately GBP 114 million, has been infused by Wadhawan Global Capital Limited (the company holding around 38% in DHFL) into this company. The money has been raised in Wadhawan Global Capital from Kyta Advisors (formerly Wadhawan Realtors), the Indian company promoted by the Wadhawan Group. 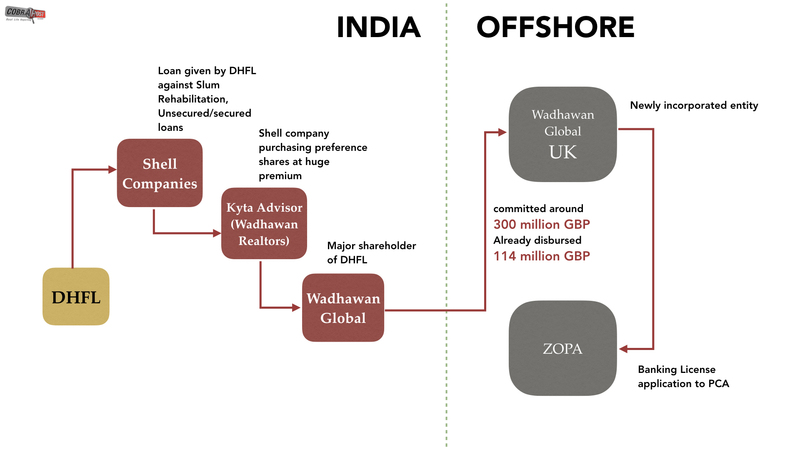 The source of Kyta Advisors is from the money siphoned off from DHFL through loan route to shell companies. Kapil Wadhawan has also joined as director in Zopa Group Limited. The company, through its 100 per cent subsidiary Zopa Financial Services Limited, has also recently applied for banking license in the UK through an application made to the Prudential Regulation Authority (PRA) of England. The money from Wadhawan Global (UK) Limited is being utilized as equity contribution in Zopa Group. It is increasing its foothold by making investments in other financial companies, for instance, Ingram Lending Limited, UK. Annual Reports of Zopa and Wadhawan Global Private Limited are enclosed as Annexure 94 and 94a. Wadhawan International Investments Limited is a company incorporated in Dubai on May 14, 2008 with registration number 626 and having its address at Unit 06, Level 3, Currency House – Building 1, Dubai International Financial Centre, Dubai, 66137, United Arab Emirates. The company has been promoted by Kapil Wadhawan and Dheeraj Wadhawan. The paid up capital of the company is US$ 250,661,000 and is currently held by Turquoise Venture Holdings Limited, which was incorporated in Mauritius on March17, 2017 with registration number C145828 and having its address at 19 Bank Street, 4th Floor, Cybercity, Ebene, 72201, Mauritius. Turquoise Group is one of the leading European advisors and investors in energy, environment and efficiency. Turquoise is also related to the US by the name Turquoise Global Holdings US LLC. The directors of the company were Kapil Rajesh Wadhawan (until December 22, 2014), Dheeraj Wadhawan (until December 22, 2014) and Jaideep Bahirwani (until November 1, 2017). Other directors are Sunil Mani Pollasary and Manish Savla. Direct investments by residents in joint venture (JV) and wholly owned subsidiary (WOS) abroad are being allowed, in terms of clause (a) of sub-section (3) of Section 6 of the Foreign Exchange Management Act, 1999 (42 of 1999), read with Notification No. FEMA.120/RB-2004 dated July 7, 2004, (GSR 757 (E) dated November 19, 2004), viz. Foreign Exchange Management (Transfer or Issue of Any Foreign Security) Regulations, 2004 (copy of RBI Regulations, Annexure 95). Any write-off in excess of USD 10 million requires prior RBI Approval. The actual write-off is US $150 million which is almost 15 times the prescribed limit of US $10 million. It is further noticed that auditors in all the companies have qualified in their auditor report for FY 2016–17 the aforesaid transaction (copy of Annual Reports – Annexures 96 and 97). During the year 2016–17 (March 20, 2017), Yardstick Developers Private Limited, a company incorporated in India belonging to the Wadhawan Group, sold their part stake (41,146,805 shares out of 44,887,424) in DHFL Pramerica Life Insurance Company Limited at a price of Rs 46.46931, aggregating to Rs 191.20 crore. This resulted in a profit of Rs. 189.25 crore to Yardstick Developers Pvt Ltd. In a similar case, a loss of Rs 183.33 crore was booked on the sale of shares of Wadhawan International Investment Limited (UAE) to Turquoise Venture Holding Limited. Moreover, an amount of Rs 33.44 crore was written off by Yardstick Developers. Yardstick Developers has disclosed in its annual report that Wadhawan International Investment Limited is their related party. The aforesaid transaction of the sale of shares of Wadhawan International Investment Limited along with loan write-off were undertaken to apparently evade taxes on the sale of shares of DHFL Pramerica Life Insurance. This can be substantiated from the fact that the sale of shares of Wadhawan International Investment Limited was made to a company (Turquoise Venture Holding Limited) which was incorporated on 17 March, 2017, just three days before the date of application by Yardstick to the RBI. It is also worthwhile to mention that permission from the RBI was not pre-obtained for undertaking the transactions, which were actually done in a hurry to avoid taxes. 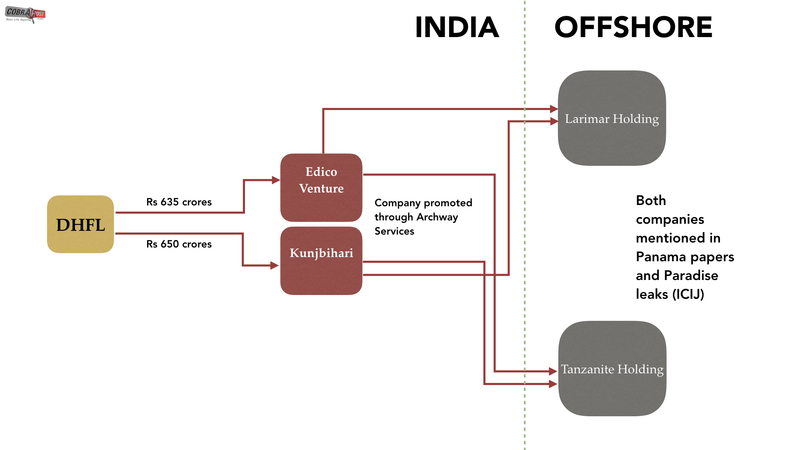 Kunjbihari is a 100 per cent subsidiary of Edico Ventures. This Indian company is a subsidiary of Archway Services Pvt Ltd which has a large investment (equivalent to the loan amount) in a company associated with Panama and Paradise leaks. As per the annual report for FY 2016–17, Edico Ventures has invested a sum of US$ 4.34 million (Rs. 19 crore) in Larimar Holdings Limited and US$ 300 million (Rs. 1,364 crore) in Tanzanite Holdings Limited. Both these companies are linked to Paradise and Panama leaks as claimed by the International Consortium of Investigative Journalists (ICIJ). DHFL has also indirectly funded the Wadhawan Cricket Lanka (Private) Limited, a cricket team owned by the Wadhawan Group through the money furnished by RKW Developers. 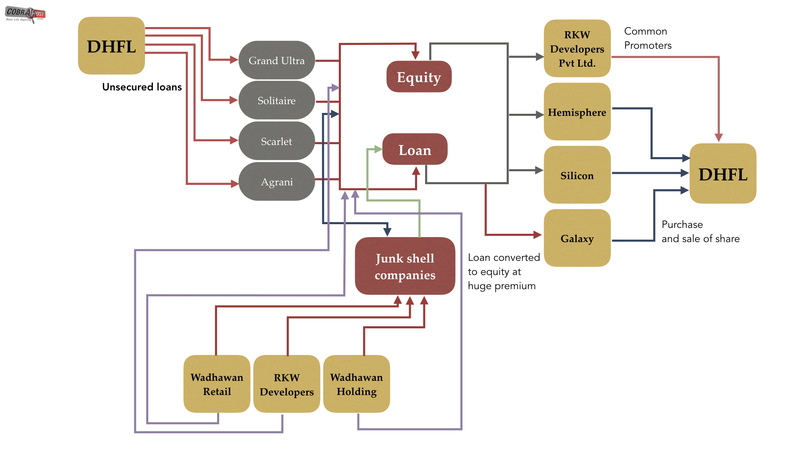 RKW Developer’s main source of income is the huge number of shares bought at very high premium by all the shell companies which were given loans by DHFL (copy of Annual Report, Annexure 99). It is of hardly any surprise that in terms of repaying the loans advanced by DHFL, nearly 56 shell companies investigated in the course of the story have defaulted in timely deposition of tax deducted on interest on time. As per the sanction letter, the interest is due to be payable every month. Accordingly, going by the relevant section, 194A, of the Income Tax Act, TDS has to be deducted on monthly rest on interest amount, since there is income being shown in company records. According to sources, all the parties have deposited the TDS on the last day of the financial year as against monthly basis and have defaulted under Section 194A of the Income Tax Act and are required to pay interest at the rate of 1 per cent for every month of delay in terms of Section 201 of the Income Tax Act. A sum of around Rs. 124 crore is worked out to be interest on late deduction of TDS for financial year 2017–18. Working enclosed as Annexure 100. The same modus operandi is being repeated by the company again and again for the past five years. Accordingly, its total interest payable on TDS default works out to be approximately Rs. 600 crore (Rs. 120 crore on an average for five years). Conclusions: Who is to blame for India’s biggest financial fraud? The case presented above is an illustration of complete and absolute failure of corporate governance (CG), and there is no way to even pretend that corporates are reliable and can commit to the best practices of the industry as required or expected by the law. The above self-regulatory mechanism is clearly farcical. It may be observed that Kapil Wadhawan is a member of the Risk Management Committee in DHFL. The person responsible for influencing a Board’s decisions about the company’s policies with respect to risk monitoring is himself a party to siphoning off public funds to the tune of thousands of crores. The Finance Committee holds the power to grant approval of loans above Rs. 200 crore up to prudential exposure norms as per NHB guidelines to any person, firm or body corporate at any time or from time to time and to grant approval for issuance of Corporate Guarantee(s) by the company in favour of the body corporates as per the provisions of Companies Act, 2013 and NHB Guidelines. Kapil Wadhawan and Dheeraj Wadhawan are also members of the Finance Committee, and are directly in a position to influence decisions to grant loans by exerting influence. Guidelines of corporate governance provide no protection against people inclined to push their personal agenda, who may easily use their position to siphon public funds. All the leading rating agencies regulated by SEBI have assigned AAA rating to DHFL’s credit-worthiness. The AAA rating is the topmost rating for any company and is reflective of its credibility in the market, so that they can borrow very easily and fetch a lower rate of interest on their borrowings. Usually, an investor considers the AAA rating is the highest degree of safety, almost as guaranteed as bank deposits. DHFL’s inner workings raises a question about the credibility and conduct of all the country’s rating agencies, which have failed miserably to identify its irregularities, as unearthed in the course of this investigation. Auditors are responsible for ensuring that the financial statements prepared by companies are in compliance with the various statutes in India and abroad, are free from material frauds and give a true and fair view of the companies’ positions. Any deviation from the statutes of law is required to be immediately reported in their annual audit reports. In the cases of the shell companies investigated, of DHFL and Wadhawan’s own companies, auditors have consistently failed to bring serious irregularities in their audit reports, which are meant to ensure that the financial statements of companies are free from any irregular activities. The irregularities that seem to have been overlooked by auditors with surprising consistency uncover the possibility of collusion between multiple auditors and the companies in question. These companies come under the ambit of regulatory bodies such as the RBI and the SEBI, which have consistently failed in their duties, despite many warning signs and the recent failure of IL&FS. The Ministry of Finance instead made the liquidity window for NBFCs easier and paved the way for more scams such as this to emerge. With all these authorities, agencies and regulatory bodies either acting blind or inefficiently, the future of NBFCs in India itself is in jeopardy. The DHFL and its ilk have further weakened the economy from within, and it shall take a long time for the market to gain back the confidence it has lost after cases like IL&FS and DHFL.